I'm always on a quest to find the best healthy snacks to munch on. That's why I was excited to find Popcorn, Indiana popcorn. If you're looking for some light snacking options, you gotta give Popcorn, Indiana a try! They were just recently voted Best Snack in Shape magazine! 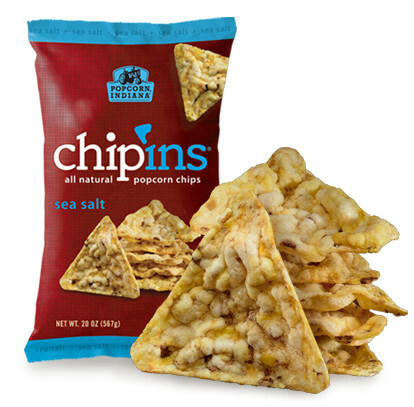 Recently I got the honor of trying out some of their delicious popcorn & Chip'ins. The Kettlecorn is a classic! It's slightly sweet and a little bit salty. The kernels are nice and big! It's hard to stop popping! The Aged White Cheddar Kettlecorn was savory and delicious! I loved the intense flavor, but it wasn't too overpowering. Plus I liked that it didn't leave my hands too messy. I love that Popcorn, Indiana knows that we, the people, love options. In fact, there are so many varieties of popcorn I have a hard time choosing which one I want! Doesn't the sound of Buffalo Cheddar Kettlecorn sound great? What about Drizzled Cinnamon Sugar Kettlecorn? Mmmm. Don't forget about Bacon Ranch! Yes, Bacon Ranch! I tried the Jalapeno Ranch Chip'ins with my tasting panel . . . we all agree that they are amazing--and have the perfect amount of heat! Plus, they're Gluten-Free, All-Natural, No Preservatives, No Cholesterol & contain No Artificial Flavors. 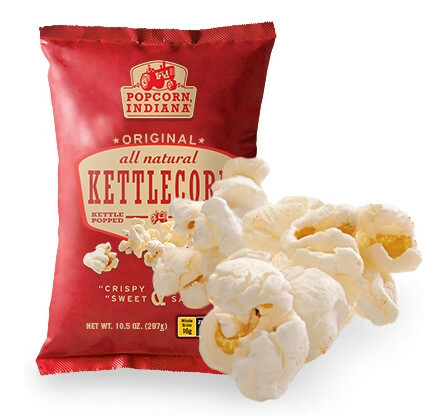 You can find Popcorn, Indiana products at Walgreens, Wal-Mart, Super Target and a bunch of other places. Check here to find a retailer near you. Get ready to crunch in a big way! One lucky winner will get a Popcorn, Indiana prize pack consisting of 3 bags of goodies to crunch on! Fill out the form for your chance to WIN! The fine details: This giveaway will end on July 11, 2011. The winner will be notified by email and it will also be posted on this blog. If there is no response from the winner in 48 hours, a new winner will be chosen via random.org. This giveaway is limited to US residents 18 years old and above only. Crunchy Deals received some crunchy munchies from Popcorn, Indiana in order to complete this review. I Filled out the form. Thanks for the chance to win! I liked Crunchy Deals on FB! I followed @CrunchyDeal on twitter. I like Crunchy Deals on Facebook (FB name: Maddie Brubaker).